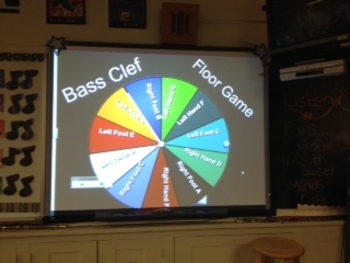 Create a Bass Clef Floor Staff with masking tape or painters tape. This game can be used as a musical center. One student touches the board to make the dial spin. Two students follow the instructions of the spinner (ex. Right Foot on A). From here you can make up your own rules. You can play for a timed period, until someone falls, or until someone makes a mistake.